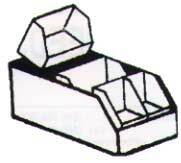 TINY BIN INSERTS add or remove related items fast and efficiently with economical insert bins. Four (4) sizes to fit your needs. Part No. Type of Cardboard Length Height Made For Appro. Terrific little time savers. Separate small quantities of small items. Lightning quick set-up, consists of 4 sides and an automatic locking bottom. Use individually or in groups to divide Bin Boxes. Packed in cartons of 100.